It's Confirmed: Breakfast Is The BEST! 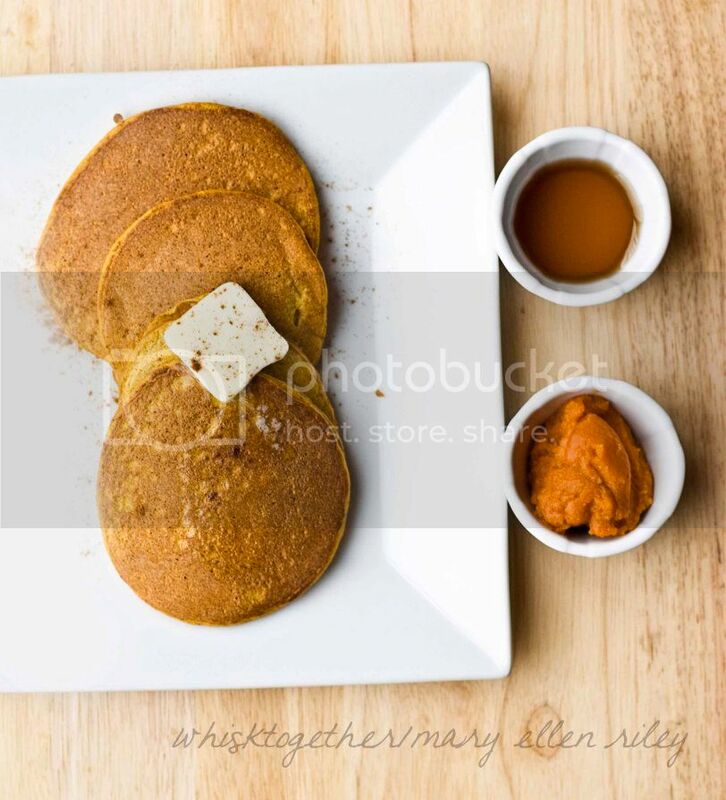 I woke up this morning and was really excited to see that Pumpkin Pancakes were on the menu! Since developing wheat + dairy allergies 8 years ago, I haven't had pancakes in…well, since then! What a deprived life I lead. Okay, okay, so I chose not to have them. I could have easy substituted some other GF flour in for wheat flour. Back to the point - I was SO super excited to test out this Pumpkin Pancake recipe. ** extra butter or oil needed for baking. Practical Paleo says that this recipe yields about 8 small pancakes for 2 servings (slightly more if you use banana in lieu of syrup). For a 'fluffier' pancake, you could also add 2 TBSP. of coconut flour if you wanted. There's a recipe for that here. Directions: In a small bowl whisk eggs, pumpkin, butter/oil, maple syrup (or banana) and baking soda. Sift in the pumpkin pie spice (I didn't have any on hand, but I made my own using cinnamon, nutmeg & ginger). On medium heat, add butter to pan and spoon small pancakes onto the skillet/griddle. Once bubbles surface, flip those babies! In review: As of 4 years ago I made a resolution to avoid sugar. I was eating way too many Swedish Fish and decided that my body didn't need all that syrupy goodness. So…that being said I replaced the maple syrup in this recipe with 1 mashed ripe banana. It definitely added just the right amount of sweetness! I also chose to use butter instead of coconut oil in this recipe. I LOVED THEM. If you're a texture person, you might find the batter to be a bit mushy, but seeing as there are no dry ingredients to add 'fluff' that's to be expected. Because my pancakes were small and flat, I was able to just eat them with my fingers. You can choose to be a grown up and eat them with a fork, adding maple syrup/butter/cinnamon if you fancy! I'm thinking that in the future I might prepare a few of these during my Kitchen Workout for the week, so on the days I need to be at work early, I can just grab a few and go! Needless to say, I will be making these again and I'm already looking forward to having the leftovers for breakfast tomorrow.